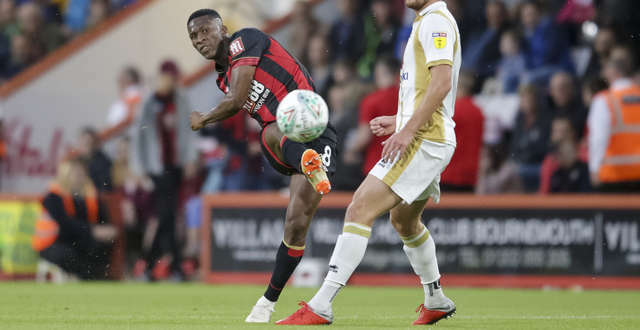 AFC Bournemouth were much changed but two first-half goals helped ease them to a 3-0 Carabao Cup win over League Two MK Dons. Lys Mousset cleverly crafted his own opening as he gave the hosts an early lead at a sold-out Vitality Stadium, Ryan Fraser was then on hand to steer home a second before half time. Maintaining their ascendancy, debutant Diego Rico hit the frame of the goal with a free-kick after the break, seeing the Cherries cantering towards the finish line and notching a third late on through Jordon Ibe as they completed a comfortable win. There were competitive bows for Rico and Jefferson Lerma from the off, and the Cherries were dominant from the get-go, taking a deserved lead after just 15 minutes. Artur Boruc's quick release allowed Jermain Defoe to play wide to Mousset, and the striker dribbled inside, nutmegged a defender and then slid under the 'keeper for his first of the fledgling campaign. Mousset forced Nicholls into a sharp save before Defoe swivelled and brought another stop from the 'keeper on the half hour, and not long later the home side had their second. Ibe sped down the right-wing and his first cross was blocked by a defensive leg, while his second was diverted into the path of Fraser who dispatched the bouncing ball home with a powerful elft-footed volley unattended from eight yards. Two up at the break, the Cherries continued on the front foot following the restart, with Rico in particular showing himself as an attacking threat, taking a venomous free-kick that came back off the crossbar after Mousset was fouled. Moments after, Lerma curled in a terrific effort from 25-yards and made Nicholls pull out a full-length save to keep the lead at two, the pace of the encounter did drop in the final 20 minutes as the home side held their opponents at arm's length. Into added time and Ibe sliced inside from the right and took aim, with Nicholls palming away his effort with a superb save, though a minute later the winger did have his goal as he stole into the box and hammered a left-footed drive low at the near post, a lovely strike to rubber stamp the Cherries' place into the third round. Following their moves to the UK from La Liga this summer, Cherries fans were finally able to get a first look at two of the club's transfer-window signings. Lerma impressed from the off, always looking for the ball, swift in the tackle and consistently showing a quick willingness to bring the ball down and look for team-mates going forwards. Rico, on the left side of defence but with plenty of attacking licence, was seen more in the opposition half than his own and was able to display promising delivery from the flank as well as a motor to quickly recover when the Dons won back possession. Both players also went close to instantly opening their goalscoring accounts for the Cherries, with the home fans already taking to the newcomers. The second-round win means the Cherries will be in the draw on Thursday for the third round, set to be played in the final week of September. A number of other Premier League sides have found themselves through, with Crystal Palace, Southampton and Fulham all winning their second-round ties. The victory over MK was a solid start as Eddie Howe's side look for a positive Carabao Cup run, as they had last season when they lost only late on in a quarter-final away to Chelsea.